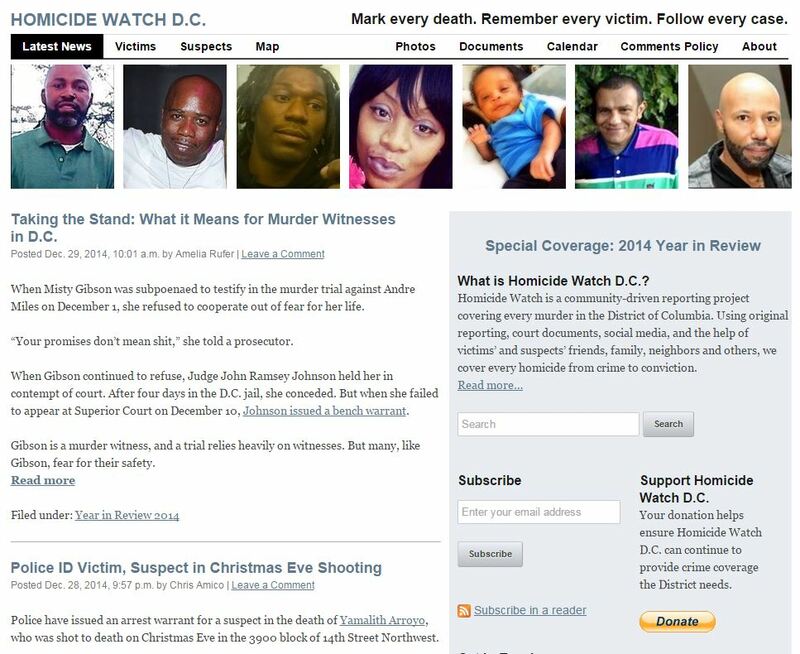 Alas, Homicide Watch DC will soon be no more. As the Washington Post notes – and founders Laura and Chris Amico previously announced – the site will be closing in a few days, at the end of the year, because of a lack of funding lack of a local partner. But arguably it’s really the victim of a lack of imagination. Not on the part of Laura or Chris, of course; if anything, their problem was being too far ahead of the pack. The lack of imagination is more about how we as an industry view what we do and why we do it. Homicide Watch didn’t need a lot of money to keep going. Laura figures operation costs are about $60,000 a year, the price of a single reporter. But they couldn’t come to terms with any local news organization, including the Post, to partner with them or acquire it. And so one of the signature examples of structured journalism won’t be around any more – although sister sites will continue to run. At one level, it’s easy to understand why a site like this doesn’t fit cleanly into a mainstream news organization’s structure. Newspapers like the Post are focused on devoting their (limited) resources to stories with the biggest bang, and with the widest audience and arguably in the greatest public interest. Covering every murder, as Homicide Watch does, upturns that core news judgment in many ways, as I’ve written in the past. But why isn’t covering every murder – not just the more “newsworthy” ones – a core part of any local news organization’s mission, and especially when the costs of doing so aren’t particularly high, it doesn’t prevent more resources from being poured into higher-profile cases, and could actually help surface broader trends and more useful stories? It’s true that a large part of what populates the site is straight-up fact-gathering, rather than finely-crafted narrative prose. On the other hand, how much of journalism is great narrative – and in any case, why can’t we have both? To its credit, the Sun-Times in Chicago does take a wider view of their mission when it comes to covering murders, and publishes a sister Homicide Watch site. Homicide Watch Chicago is dedicated to the proposition that murder is never a run-of-the-mill story. Attention must be paid to each one, not merely a select and particularly tragic few. We understand the reality of public’s demand for news – that some stories get more attention than others. But all murders represent a degree of human suffering – direct and indirect – that cannot be ignored. Our goal is to tell the story of every murder in the city, so that together we might fight the tendency to view homicides as just another rising or falling number, like mortgage rates or batting averages. So it is sad that great example of journalism innovation will be closing its doors soon. But its ideas live on – and it’s proven, through its four-year run, that such sites do have an audience and fulfill a news need. It’s been a wonderful, living, proof-of-concept, and the more we have, the more we learn, and the more the ideas of structured journalism become embedded in newsrooms and audiences. It’ll just take a little time. But we’re getting there.